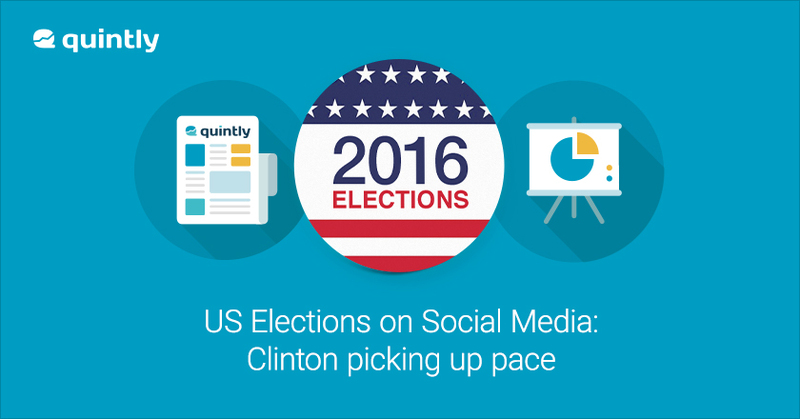 The social media analytics provider quintly just revealed findings regarding the performance of the two presidential candidates Clinton and Trump. Since the last analysis quintly published, Hillary Clinton was able to improve her social media performance. In terms of interactions Clinton is picking up the pace. In June she was able to double their likes, comments and shares on Facebook. Whereas Trump just managed to increase his interactions by 8%. To monitor all developments, quintly also launches a live data hub with all information in one place - in real time. The analysis furthermore shows how many percent of posted content on Facebook is sponsored. Here quintly detects a potentially important reason why Clinton is gaining traction on social media. According to quintly’s sponsored post detection, Clinton sponsors approximately 40% of her posts and Trump just 20%. In terms of post frequency the opponents publish their social media content in a similar manner. Comments Alexander Peiniger CEO and Co-Founder of quintly. One further important finding are the growth rates of the two presumptive nominees. On Facebook Clinton won more fans (615k) than Trump (588k) in June. However, on Twitter the billionaire from New York managed to receive 851,450 new followers and the former secretary of state just 137,942. For more information you can find the analysis here and the quintly live data hub for the presidential elections here.